Beach babies are the best. I live near the beach and love taking my baby, toddler and kids often. Taking a baby to the beach, however, is a little more work and requires a bit of extra planning. Always pack the beach essentials – sunscreen for baby, baby sun hat and beach towel. I have learned a lot from the numerous trips to the beach with kids. The following practical tips for babies at the beach include dealing with the sand, keeping everyone happy, and using my favorite beach products. 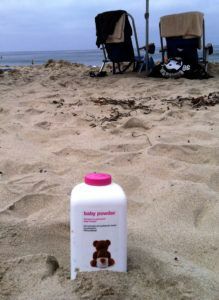 The number one secret of surviving a beach trip with babies is Baby Powder! Baby powder dries up the moisture causing sand to stick to you, allowing you to brush it right off. 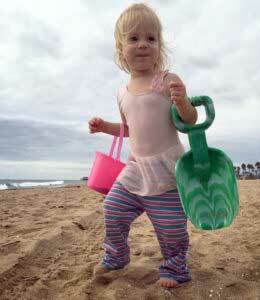 Just sprinkle some baby powder on baby’s sandy bum, or your kid’s sand covered feet, and towel the sand off. It’s miraculous – it really works and it makes the beach so much more fun. You can worry less about cleaning the sand off everyone, and let them just be kids. 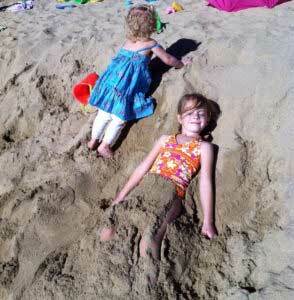 It wouldn’t be summer if someone didn’t get buried in the sand! The tide isn’t the same at every beach. If you have really young kids who would enjoy the water, search for a beach with a gentle, or nonexistent tide. Nothing spoils the fun of baby at the beach like getting tossed by a surprise wave. Most harbor beaches have little to no waves. This not only makes the water very gentle for the youngest of swimmers, it makes it warmer as well! 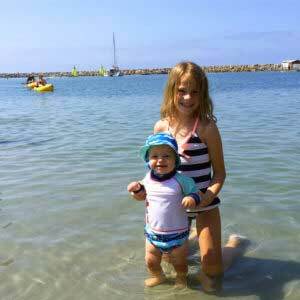 One of our favorites is Baby Beach at Dana Point Marina in Orange County, California. My crawling baby can safely enjoy the edge of the water, and my older kids don’t mind the change of pace as they walk around waist deep in the harbor. If baby won’t be getting in the water, there’s no need for a swim suit. Dress baby in a lightweight outfit you don’t mind getting dirty. You could even use a lightweight footed sleeper. Pants keep most of the sand on the ground and off of the baby – especially away from the diaper area, where it will rub and chafe. Of course, baby needs a swim diaper and swim suit if he’s going to get wet, which is where the baby powder tip comes in. Water shoes are great for protecting everyone’s feet on a rocky beach, or while exploring tide pools. They can also make a difference in how much baby enjoys the beach. Tight fitting mesh shoes keep out most of the sand, whether in the water or out. 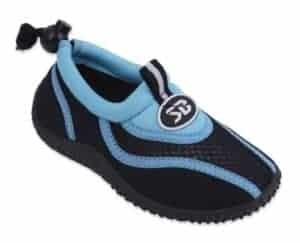 Water shoes will make a more pleasant beach experience for everyone, especially for if you have a child who complains about sandy feet. The Sunville Water Shoes provide quality and affordability. The adjustable ankle gives you a perfect fit. 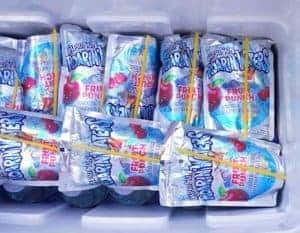 Freeze juice pouches such as Capri Sun, and half-filled water bottles to use instead of blue ice in the cooler at the beach. You have to remember to put them in the freezer the night before, but it’s worth it. Edible ice makes your cooler that much lighter at the end of the day. My real secret, though, is that I save one for each of my kids to drink when it’s time to leave. It cuts down on the whining about leaving the beach, and cools them off when we get in the car. 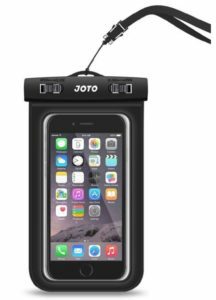 Waterproof phone pouches or cases are handy for keeping your phone or device dry while taking pictures in the water, or for using at the pool or water park. You want to capture of the joy of baby at the beach after all! A zippered pouch is even more handy at the beach because it keeps sand out of the tiny crevices and ports of your device. You can substitute a plastic baggie for a cheaper fix. It’s by no means waterproof, but it will help keep the sand away from your phone. 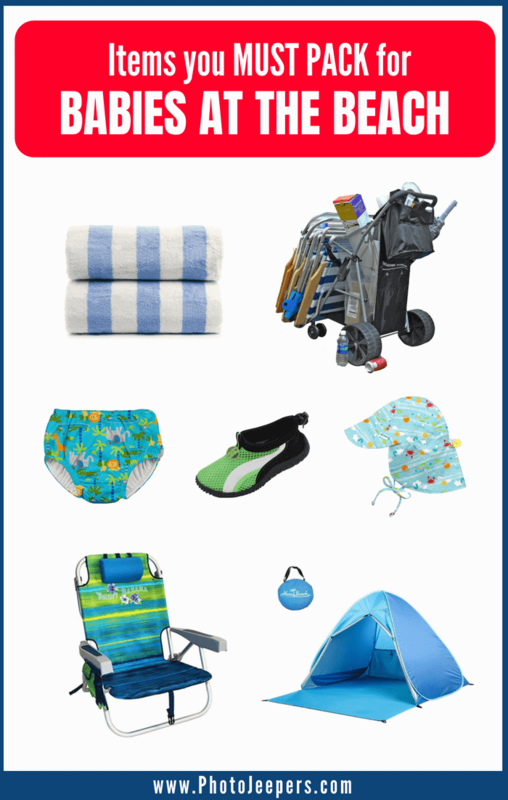 Keep a designated ‘sand free’ beach bag for items such as extra clean diapers, and clean clothes for baby. You’ll want to clean little ones off with baby powder and change them into fresh clothes before putting them in car seats. Keep those clothes sand free with a zippered bag. I have a zippered pouch on my beach chair that I use. The trick here is training everyone to keep their hands off the ‘sand free’ bag. 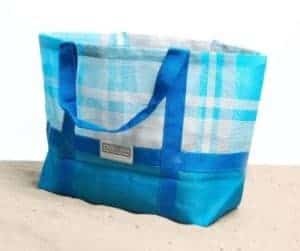 There is a bag designed with a unique patented weave that creates a “one-way sift” ensuring sand, dirt and dust will fall through to the ground below but particles underneath do not penetrate through to the contents inside the bag. I need to try this CGear Sand-Free Tote Bag. There is nothing like digging through a bag of wet towels and sandy toys in a hot parking lot with whining kids to find the keys to the car. 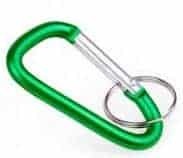 Attach a small carabiner to your keychain so you can clip it onto the outside of your beach bag and find your keys easily at the end of the hot day. I never bring a big cooler to the beach. Use a cooler bag if at all possible. 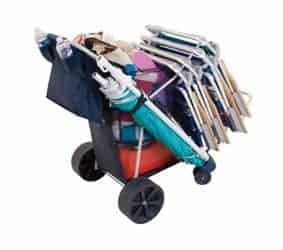 It will cut down greatly on the bulk and weight of what you have to haul with you, especially if kids outnumber adults. 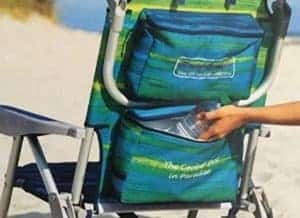 My Tommy Bahama Backpack Beach Chair actually has a small cooler pouch attached to the back, and half the time, that’s all I bring. We pack room temperature snacks and just keep a few cold essentials and drinks in the small cooler pocket. Another beach item that I skip is the beach umbrella. I spend most of my beach days chasing the baby and the other kids around the beach, so I wouldn’t be sitting in the shade much. An umbrella is just one more thing to carry and I’ve decided packing lighter is better. If you go to the beach with friends, you can coordinate whose turn it is to bring the umbrella and share! I strongly recommend taking less stuff to the beach, especially if you can’t easily carry it all in addition to the baby. But if you are a frequent beach visitor, another option is to invest in a beach cart. The Rio Beach Cart is the perfect beach partner. Fill it up with towels, sand toys, cooler bag and snacks. Stack your chairs on the side and wheel the whole thing right over the sand. A beach cart is a lifesaver if you can’t carry it all, and stairs are no longer an issue. A beach tent will help protect baby, and anyone in the family, from the heat, sun, wind and the roughness of the sand. If your baby will be napping at the beach, you will want a sun tent. There are various types and sizes of baby sun tents you can buy. Be sure to invest in a good quality beach tent that provides UV and wind protection. 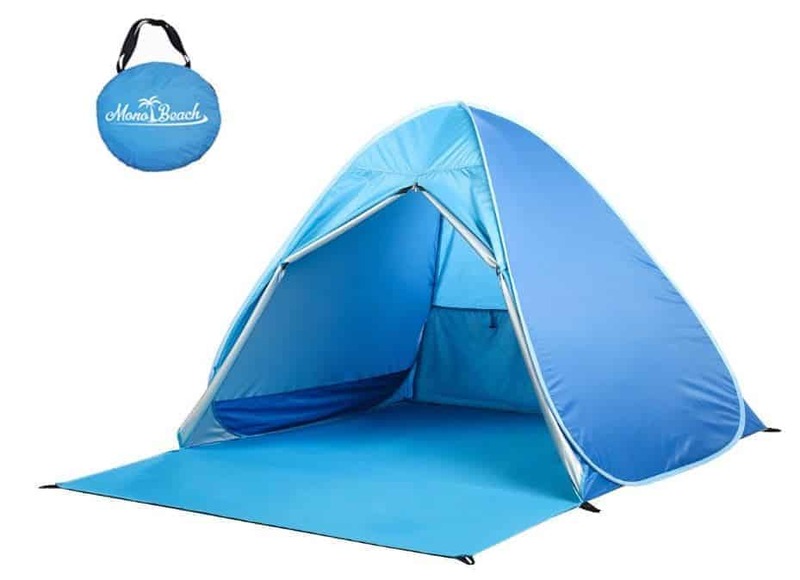 Click here to find a review of 10 Best Baby Beach Tents. Some great tips here for travelling to the beach with a baby. I never knew about the baby powder – what an ingenious trick! Good to know about these little things for future. I know it’s hard when sand can get EVERYWHERE! We’d add sunscreen too to the list given the harsh rays in New Zealand. Baby powder is amazing – give it a try! With children it really requires a lot of planning. More so at beaches. 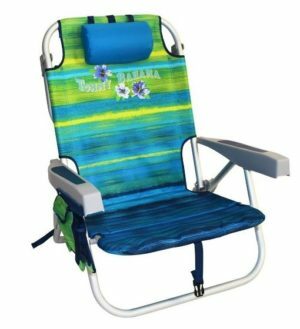 You have shared some cool beach aids which are a blessing to parents of young kids. Mine have grown out of this stage now. The beach cart would be helpful even today though. The beach cart is so helpful for carrying all the stuff! An interesting list of very useful items. Surprised to see that sunscreen isn’t on the list or a hat! I guess coming from Australia it’s drilled into us – slip, slop, slap and cover up! No beach trip as a child was complete without a mum attacking you with sunscreen. Sunscreen is definitely important! These tips were meant to go beyond the basics of sunscreen, hat and towel. I’ll edit the post to make sure that’s clear, thank you! Very useful tips. It is surely a very difficult task. TBH I can’t even imagine handling kids in a vacation or for that matter in any other situation. But somebody has to do it and I admire who can manage this. Travelling with kids can be tough, but it’s so rewarding. Traveling with kids could be so much fun, provided you plan well. While I knew about rest of the things, I didn’t know Baby powder can be useful in brushing off the sand. Nice post! So much information for parents. I could only imagine for now how difficult it could be to travel with babies. These are great, practical tips and some are even applicable even for adults. Thanks for sharing! I have friends who can learn from this. Traveling with kids takes more preparation, but well worth the effort. Yes! Many of these tips apply to adults at the beach as well! I still have a long way to go when this post will be of use to me, but I do have some of my friends and relatives, who do travel with babies. This post is going to be a huge savior for them, making that beach vacation hassle free. Making a beach vacation hassle free is a good thing for anyone, even if it’s just you! Some of these tips do apply to everyone – the sand free bag, caribiner for your keys, etc. Thank you for sharing the post with your friends and relatives. These are some good tips although I’m not a momma. I’ve met a lot of people who travel with their kids and it’s indeed a challenge. Packing lightly is essential I think. And never thought baby powder works that way. Baby powder is wonderful – I use it even when I’m not taking kids to the beach. Give it a try! Though I don’t have babies, I have traveled with couples who have babies. I know it’s quite a challenge. I will share this blog with those friends of mine, perhaps. Designated sand bag is my favourite pick for the reasons you mentioned. A designated sand bag is a must – and I like the waterproof pouch for my phone too – for water and sand!